Booksteps is a library program for schools to obtain sustainable access to quality text books for students and teachers. The goal is to increase students’ chances to pass school exams at a desired level, enriching their general knowledge and offer better prospects for their future. At least 5 schools working together to share resources. Selecting the best text books available within the national curriculum and adding quality to the schools. Booksteps provides funding for an initial stock of books and for a start-up period to get the system running. Selection and training of qualified librarians. Implementing a system of tight supervision and administration, including secure storage and transportation of books. Organizing local ownership by participating schools. I am the king in math and other subjects because of your books which I am reading in school. The books .. have made students of our school to improve on their grades tremendously. The books have not only improved on their grades but also helped them to approach questions correctly in subjects like Chemistry and Mathematics. The students have continiously used these books and many have excelled by using them. Standards of education are lifted to a level to match with other regions. Booksteps was started as a joint initiative of the Ugandan educationalist Joseph Asutai and the Dutch foundation e-Progress as a reaction to the deep scars left by the civil war in Northern Uganda. One of the tragic consequences of the civil war were the learning disadvantages incurred by many schoolchildren in the region. Among the various challenges that schools in this area were (and are still) facing is a lack of teaching resources, especially in public schools. As a result, schoolchildren have little chance of realising their academic potential so as to improve their lives and those of their families. In answer to these challenges Booksteps has started a program in which quality books were purchased with the goal of usage by the cooperating schools, to share and make optimal use of expensive resources. Librarians were employed and trained by experts from the University of Gulu to manage the books, and a studying space was created where students could gather and prepare for their exams. 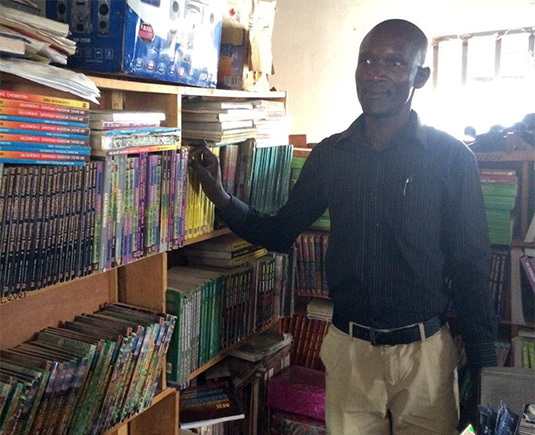 Booksteps libraries have been set up in former IDP camp Pagak, Gulu and the village of Barr near Lira. Gradually, experience was gained in running these libraries in such a way that they could become sustainable without further resources from the donors. The success of the program was demonstrated through improved exam results in the participating schools; this has led to the desire to expand the program. It is now ready to be implemented in new locations. What do the donors contribute? Initial investment in quality text books: depending on the student population approximately 4000 books are initially purchased for a cooperation of 5 schools. The books are shared amongst the schools for the duration of one term. At the end of term all books are returned to the central librarian for restocking, repair and replacement as needed; they are then redistributed to the schools for the new term. Initial investment in a necessary physical infrastructure: after an inventory has been made of the existing infrastructure the necessary measures are taken. This may include purchasing furniture for secure storage and studying facilities. In rural areas it may also include buying solar panels so that students can study in the evenings. First years of salary of librarian and assistant(s): because schools need time to organise funding for running costs, the Booksteps foundation provides funding to pay salaries for the administration and management of the library. Typically, a collaboration of 5 schools will need one managing librarian and one assistant to administer and supervise book distribution. The salaries are sponsored over a three-year period, with a steady reduction: while in the first year the full salary is paid by the donors, by the third year this is only 25%. Together, the schools have to pay the remaining amount. Availability of instructor(s) for training of librarians and teachers: Staff training is provided by experienced librarians from existing Booksteps locations. Flyers and communication material: to promotethe library amongst parents and students, communication materials are provided, including posters and flyers. What do the schools contribute? Collaboration structure made up of between 5 to 10 participating schools: a managing board needs to be formed, with each school being represented by a school head or mandated board member. The board will decide on issues such as the contribution made by each school and on hiring the central library staff. A mandated program manager to coordinate program activities and serve as contact person to the Booksteps organisation. The program manager takes part in board meetings and can speak on behalf of all participating schools. Availability of teachers and library staff for training and book management: teachers and librarians from the participating schools must be available to receive training and spend time to properly manage and look after the books. Managing librarians will receive training so that they can organise regular refresher trainings for teachers and school librarians. Training and meeting facilities (transport, refreshments, meeting space): at trainings and meetings with the Booksteps organisation the schools provide meeting spaces and the necessary facilities for all participants. Housing and energy costs for central book depot and library: the schools agree on a location where the books can be stored and the central librarians will supervise book distribution. Ideally, this central location also provides a study room for students and teachers. Salary and running costs after start-up period: during the start-up period the schools must take measures to find structural funding. Depreciation costs: a yearly amount is set aside to purchase replacement books and add new titles, as needed. Maintenance of physical infrastructure: the physical infrastructure that was set up to run the library, including furniture, locks, book caskets and other inventory, needs to be maintained by the schools. Where can the schools find funds for running costs? Funding for each school can be found by charging a small termly student fee once the library has been established. Experience with current locations has proven that a termly contribution of about 2.000 UGX ($ 0,60) per student is sufficient to pay for proper administration and management as well as building up funds for book replacements. Depending on local conditions, contributions may also be found from local governments or within the existing school budget. If you are interested to participate in the program please contact us at info@booksteps.nl. Booksteps is looking for sponsors to help start up new library locations. For companies in Uganda it can be attractive to support the local community in their own business region and improve their visibility in a positive way. If you are interested to help, please contact us at info@booksteps.nl.